Those prices can't be right, can they? Why not? The last SteelBooks had the same price I think. Oh, are these the 5A and 5B editions? I was thinking 1-3. Aside from that though, the WWA costs the same as the WEA which is a little odd. Great looking steelbook, wished someone will use that back art image and since FA did this is the one I will be after! is it cheaper if directly or GB? Are GB shipment rates less than 5€? I have the Italian Steel and the HMV Deluxe box on order but will probably jump at this as well. Absolutely LOVE the art! Am actually one of the few who seemed to enjoy this movie(it’s far from faultless) but with so many options for steels, I might hold off and pick a fave further down the line when they are all out. Choose my fave. Hopefully, they are not sold out yet. FAC is extremely overpriced, and that's even counting the ridiculous shipping prices. But they know people here will buy anything so.. I think it's the same for the unnumbered Editions. So it's 20,49€. Actually I meant it the other way as I thought they were the prices for the FAC editions, then I realized they were for the unnumbered E5A and E5B. 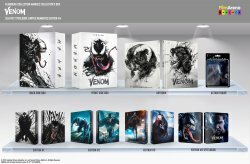 For steelbooks only if you can order 4 in one package it is cheaper but if you order FAC editions there is no chance to combine so it was at least some time ago. I don't know if anything has changed since then.